Smith Mountain Lake in Franklin Bedford Pittsylvania, VA - 3D Map 16 x 20 IN - Laser carved wood nautical chart and topographic depth map. Powers Lake in Kenosha Walworth, WI - 3D Map 16 x 20 IN - Laser carved wood nautical chart and topographic depth map. Loon Lake in Warren, NY - 3D Map 16 x 20 IN - Laser carved wood nautical chart and topographic depth map. Lake Champlain (St Albans Bay Region) in Franklin Grand Isle, VT - 3D Map (Black Frame/No Glass Front) 14 x 18 IN - Laser carved wood nautical chart and topographic depth map. Deep Creek Lake in Garrett, MD - 3D Map 16 x 20 IN - Laser carved wood nautical chart and topographic depth map. Black Lake in St Lawrence, NY - 3D Map 16 x 20 IN - Laser carved wood nautical chart and topographic depth map. Table Rock Lake in Barry Taney Stone Carroll AR Boone AR, MO AR - 3D Map 16 x 20 IN - Laser carved wood nautical chart and topographic depth map. 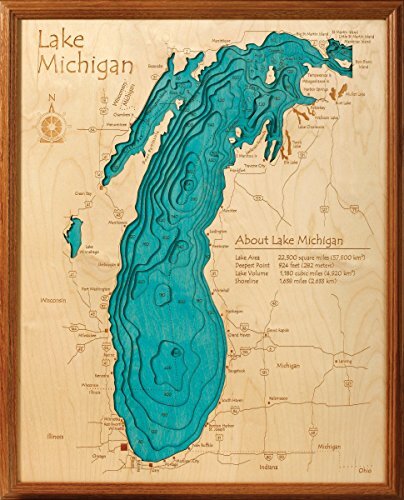 Lake Michigan in Great Lakes, GL - 3D Map 16 x 20 IN - Laser carved wood nautical chart and topographic depth map. Donner Lake in Nevada, CA - 3D Map 16 x 20 IN - Laser carved wood nautical chart and topographic depth map.